Today, the Taoiseach, Enda Kenny, together with the Minister for Education and Skills, Richard Bruton and Minister of State for Gaeltacht Affairs, Sean Kyne launched the Department of Education and Skills’ Policy on Gaeltacht Education 2017-2022. The launch was held in Scoil Náisiúnta Mhic Dara, An Cheathrú Rua (Carraroe), Co Galway. The development and implementation of the Policy on Gaeltacht Education 2017-2022 is a central commitment contained in Minister Bruton’s Action Plan for Education 2016-2019 which was published in September of this year. Speaking at the launch, the Taoiseach said that he believed that the Gaeltacht was enormously important for the future of the language and Irish culture. “This Policy is the first comprehensive strategy for education in the Gaeltacht since the establishment of the State. The Government is strongly committed to implementing the actions in the 20-Year Strategy for Irish and this Policy on Gaeltacht Education sets out how we will support Gaeltacht schools to provide high-quality, Irish-medium education to the children of the Gaeltacht,” said the Taoiseach. Minister Richard Bruton described the challenges faced by Gaeltacht schools as they taught children who came to school with very varying levels of familiarity with spoken Irish. “As Minister for Education and Skills, I want to ensure that the right conditions exist to develop excellent Irish-medium schools in the Gaeltacht,” said Minister Bruton. “Under the Policy, schools in the Gaeltacht will have the opportunity from 2017 to seek recognition as Gaeltacht Schools in line with linguistic criteria. I hope that the recognition process will be encouraging and inspiring for schools, and that schools will be attracted to participate in it,” he added. Under the Policy, a recognised Gaeltacht school will be a school where the school commits to delivering all curriculum areas and subjects through the medium of Irish. Schools that opt for Gaeltacht school status will have up to five years to achieve this status. These schools will gain access to packages of additional teaching and other resources in a staged way as they demonstrate progress towards Gaeltacht school status. “Our goal is to see recognised Gaeltacht schools being the schools of first choice for parents in the Gaeltacht,” said Minister Bruton. Recognised Gaeltacht schools will also be required to engage with their communities in the Gaeltacht language planning process under the Gaeltacht Act, 2012. Minister of State for Gaeltacht Affairs, Seán Kyne welcomed the publication of the Policy, and especially the commitment that schools would be able to participate fully in the language planning process in each Gaeltacht area. “The requirement that Gaeltacht schools participate in the language planning process illustrates how important it is for schools and their communities to work closely together to strengthen the use of Irish,” he said. Introduces a policy whereby schools located in Gaeltacht planning areas can opt to seek recognition as a Gaeltacht school – a Gaeltacht school will be a school where the school commits to delivering all curriculum areas and subjects through the medium of Irish and engages with the community in the Gaeltacht language planning process. Schools that opt for Gaeltacht school status will have up to five years to achieve this status. These schools will gain access to packages of additional teaching and other resources in a staged way as they demonstrate progress towards Gaeltacht school status. Seeks to align the work of Gaeltacht schools closely with the language planning process under the Gaeltacht Act. An Taoiseach Enda Kenny, Minister Richard Bruton and Minister of State Sean Kyne will be in Connemara today to mark a series of significant engagements. These are the launch of a major new Gaeltacht Education Strategy, the turning of the first sod on a new building for Clifden Community School and the official opening of the upgraded Leenane Water Treatment Plant. Minister of State for Gaeltacht Affairs Sean Kyne will attend the official opening of the upgraded Leenane Water Treatment plant at the Leenane Community Centre at 10am. This morning’s event follows the recent completion of one million euro works to the facility, to provide safe and reliable drinking water to several hundred residents in the area. Minister Kyne will then join Taoiseach Enda Kenny and Education Minister Richard Bruton for the launch of the Government’s new Gaeltacht Education Strategy at Scoil Mhic Dara in Carraroe at noon. The strategy covers early-years, primary and post-primary education in Gaeltacht regions across the country. Measures include the teaching of all subjects through Irish, not teaching English during the first two years of primary school, supports for teacher training to improve numbers and reform of the Irish language curriculum to reflect the different needs of Irish and English schools. Minister Bruton will then make his way to Clifden, where he’ll witness the turning of the sod on a long-awaited new building for Clifden Community School at 3pm. The project involves the demolition of the existing school and prefabs and the construction of a new two-storey and part three-storey school. The new building has been hard sought for the past fifteen years and it’s hoped the project will be completed in about 18 months. Photographs of children and teachers at Bunscoil an Iúir Hallowe’en Dress Up day. 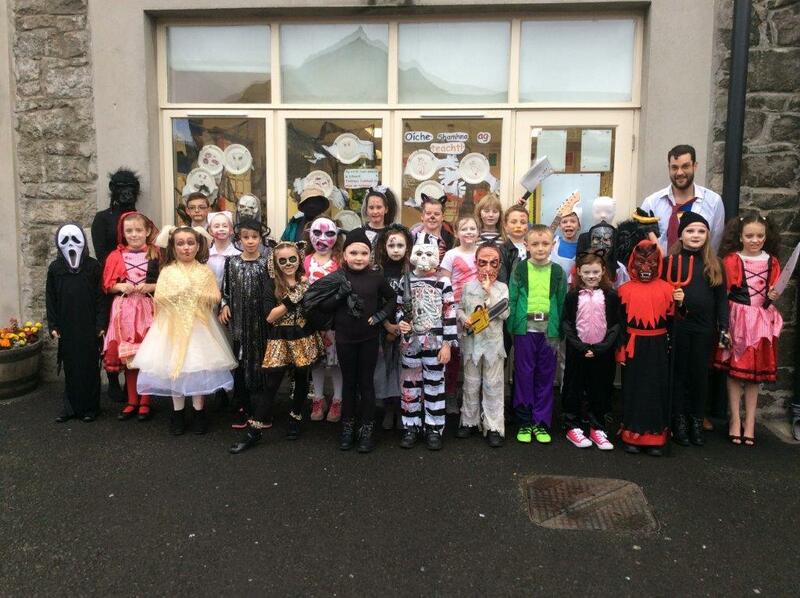 This photograph is children and teachers from rang 5/6/7. The Government’s new Policy on Gaeltacht Education 2017 – 2022 will be launched by An Taoiseach Enda Kenny, Education Minister Richard Bruton, and Minister of State for Gaeltacht Affairs, Seán Kyne, in An Cheathrú Rua, tomorrow. The policy, which will be launched in Scoil Mhic Dara, forms a central part of the 20 year strategy for Gaeilge and sets out the Department of Education’s vision for “the provision of a quality education through Irish in Gaeltacht schools”. It is drawn from public consultation with Gaeltacht communities and research with linguistic and educational experts. Measures contained within the new policy include supports specifically designed for and targeted at Irish speakers; new ‘total immersion’ approach whereby all subjects, apart from English, will be taught through Irish, and a specific policy of not teaching English in the first two-years of primary school; a requirement that Gaeltacht schools plan for and deliver different Irish language provision to learners who are native speakers and learners of the language; supports for teacher training to enhance the supply of Irish language teachers; introduction of dedicated continuing professional development opportunities for teachers in Gaeltacht schools; specific supports for Gaeltacht school principals and management; reform of the Irish language curriculum to reflect the different needs of Irish-medium schools and English-medium schools. The measures will be supported by annual additional resources that will be ring-fenced for schools recognised as Gaeltacht schools. Letterkenny will become a Gaeltacht Service Town, it has been confirmed. Following a meeting held on Tuesday evening, €20,000 of funding has been secured to implement a range of plans for the town to become a Gaeltacht Service Town. At the meeting last night (Tuesday), a committee was established to implement the plans that have been discussed for a number of months by interested stakeholders. A number of ideas were discussed at the meeting including the erection of extra bi-lingual signage and a Gaelic speaking drop-in centre. Speaking to the Letterkenny Post, newly appointed committee member Cathal Greene said the committee would be laying plans for the next two years to promote the Irish language. “This is another aspect of promoting Letterkenny, only it’ll be through the medium of Irish,” Mr Greene explained. Donegal county councillor, Jimmy Kavanagh (FG), who was the only non-Irish speaker at the meeting, welcomed the formation of the committee. “This is a good initiative that Letterkenny can only benefit from,” Cllr Kavanagh said. “Letterkenny is well place to be Gaeltacht Service Town, it effectively already is one. More and more people from the Gaeltacht are coming into Letterkenny for different things like shopping and education, so it can only be good thing,” Cllr Kavanagh added. Údarás na Gaeltachta and Foras na Gaeilge, have been working with relevant organisations to prepare and implement the language plans. Under the Gaeltacht Act 2012, Gaeltacht Service Towns are defined as those towns situated in or adjacent to Gaeltacht Language Planning Areas and which have a significant role in providing public services, recreational, social and commercial facilities for those areas. A meeting aimed at forming a committee to help in Letterkenny’s bid to become a Gaeltacht Service Town will be held tonight in the Gweedore Suite, McGettigan’s Hotel, Upper Main Street, Letterkenny. The event will run from 7pm to 9.30pm. Music and chat along with supper! Simultaneous translation shall be provided.